My older brother has been active as an unknown singer for a few years. He really likes singing and playing guitar since a young age so he told our parents that he wants to be a musician but our parents opposed him to the end.. He barely got permission from our parents to be active in music industry.. That's why he really wants to prove our parents that he can and will be a successful musician.. But still, since he's not signed with any company, he can't promote his songs.. And I noticed that he's having a hard time with it. These days, he hasn't been getting any sleep because he's working on his new album..
And finally, he released his album today. 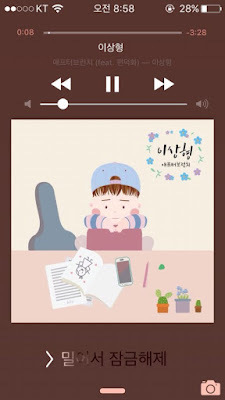 My brother's stage name is 'After Brunch (에프터브런치)', please listen to his songs even if it's for once! There's nothing I can do to help him beside this.. I really want to see his smile again..
1. [+182][-4] The album's cover is so cute.. And his songs are actually very nice, they somewhat make me feel really good! I'm currently listening and downloading all of them. I hope things will turn out well for your brother! You're such a nice sister..
2. [+115][-5] I've listened to some of his songs, and I really think his songs are good! I will help you to promote his songs, especially to my friends! I hope things will turn out well for him..
6. [+51][-0] No matter how big is the power of Pann but he's on the chart now because of his own talents! 7. [+33][-0] Whoa.. I witnessed another proof of Pann's power..
8. [+27][-0] I put one of his song as my blog's background music! 9. [+21][-0] Whoa, he's now on the most searched keyword in Melon!! Number 5!! Please tell him that his songs are so nice!! 10. [+19][-0] Hul.. OP-ya?? You mean this After Brunch? ?